The number of unread emails is shown incorrectly in the messaging menu and unity launcher icon of thunderbird though thunderbird application shows the correct count. See the attached screenshot for the illustration. I can confirm this. The only solution I've found so far is to close and restart Thunderbird. 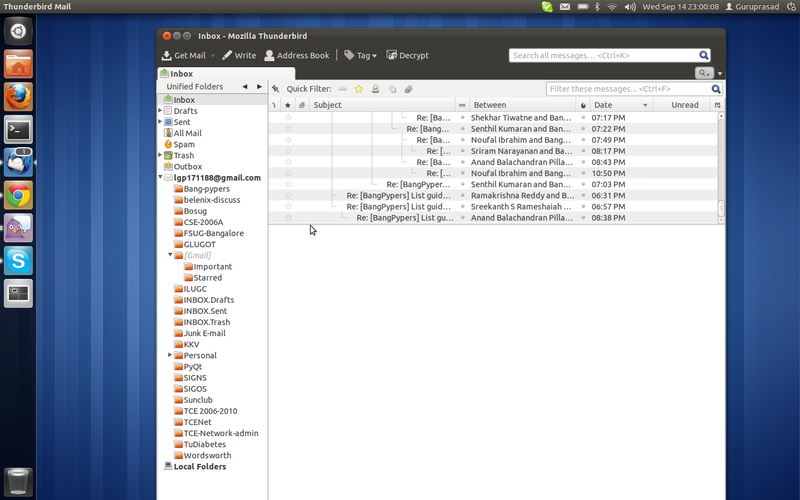 Using thunderbird 7.0~b3+build1+nobinonly-0ubuntu1. My Messaging menu does not contain Thunderbird at all, just a "Mail" item and when I get new mail, it does not reflect that. Also on the launcher icon for Thunderbird there is no unread count showing over the icon. I am rather disappointed with this situation and is there anything I can do to fix it? Or is that the work involved in this bug. I only have Thunderbird installed and no other mail programs. If I click the Mail item in the Messaging menu it takes me to Thunderbird but there is no unread count available visually anywhere. I do have notifications installed which pop up a dialog box when mail arrives. This is frustrating because all these things used to work in the previous Ubuntu version. Accepted thunderbird into oneiric-proposed, the package will build now and be available in a few hours. Please test and give feedback here. See https://wiki.ubuntu.com/Testing/EnableProposed for documentation how to enable and use -proposed. Thank you in advance! Note, the upload here doesn't actually seem to fix this. Sebastien showed me a fairly reliable way to reproduce this still at UDS. This will now have to wait until after the security update planned for Tuesday. This wasn't actually fixed, per the 8.0 changelog, so reopening. I think that a problem with indicator and icon is also that, when you erase the message count in the indicator, the icon count isn't erased and it continues to show the previous number. Pushed up to revision 90. Bug is still here for me too, with the new Thunderbird 11.0 (and Ubuntu 11.10). Still there in Thunderbird 11.0.1 (and Ubuntu 11.10). As of today this bug ist still existent in Oneiric with all updates installed. The strange thing is that it is working correctly most of the time. But 2-3 times a day I have to click on the unread messages in the messaging menu although Thunderbird is already focused and all messages are read. This is very confusing, and I recommend to turn of the messaging menu addon in Thunderbird to other users. For me (so far), it seems that this has been fixed with Thunderbird 11.0.1 and Ubuntu 12.04. I made the observation that the indicator is only reset after some time (using Oneiric with all updates installed). I didn't reset the indicator manually, and after some time (let it be 20 minutes) the indicator reset itself correctly. Of course this is too long if I get notificaiton about new emails via IMAP+ (idle) immediately. Ah. I never had the patience to wait that long. If you are intending on upgrading to Precise, though, you might find this fixed. Hmmm, although it does take perhaps 20 seconds to go from blue to black sometimes. The icon in the launcher does not show the right number of unread emails, too. Precondition: There are no unread emails. The icon does not show a number at all. Everything is ok.
1) Some (say 3) emails arrive. The icon shows the correct number of unread emails (3). 2) I read 2 of them and let the last email being unread. The icon still shows that there are 3 unread emails which is wrong. 3a) When I read the last unread email the icon does not show a number at all. Everything is ok again. 3b) When another email arrives the icon shows the correct number of unread emails (2). 3c) When I read all emails but decide to set one email to the status "unread" the icon shows no number at all which is wrong. In addition it does not really count the number of email having status "unread" but it only considers e-mails since the last update. I can reproduce the last fact quite easily because I use the "unread" status of an e-mail not to mean that I did not read it but as a reminder that I should take action upon it at some time. So emails do not get the "read" status when I read them but only when I set them "unread" manually. This means I have 28 "unread" emails right now but the icon does not show a number as I "read" the last emails that arrived. If I'm not mistaken, this bug is still present in precise. Thunderbird seems a pretty important piece of software on an ubuntu desktop though. Bug still exists in Ubuntu 13.04, Thunderbird 17.0.5 (clean install). Obviously not fixed. This should be changed to Triaged again. Open : "Tools -> Options -> Advanced -> General -> Config Editor (button)"
Search for `extensions.messagingmenu.inboxOnly` set it to true and that's it. @Pius Please don't change the bug status from Triaged to Confirmed unless there's a reason for it. Triaged bugs are also confirmed by definition. Also, Oneiric has already reached end-of-life status; do you mean the bug is present in Ubuntu 14.04 instead? Bug still exists with Thunderbird v45.3.0 on 16.04 .. but recently i discovered some solution : when clicking the envelop icon in the Ubuntu notification bar (upper right, next to the clock) and then clicking the inbox(es) in its menu, the little number at the Thunderbird launch icon disappears ! So, i don't have to close and re-open Thunderbird anymore, however, this is a workaround, not a real solution .. but maybe this will lead to a real fix .. Using ubuntu 16.10 and I am left with the unread emails counter by having a filter which marks incoming mail as read and sends it to trash (using some criteria). The counter is not reset despite not having any unread email in inbox. I noticed that it resets sometimes if I receive an email that is not filtered and then read that email. Somehow this triggers something and the unread count works again. @mihai.ile : yes, i also encounter the bug has something to do with the filter function "mark email as read". I have filters which move some mail to other folders. So I get unread counts in the thousands where there are no unread emails in Inbox. Since Unity is going away I guess the fix is to switch from Unity to Gnome. This is still happening with Ubuntu 18.04 (Gnome) and Thunderbird 60.5.1. If I setup a message filter to move emails to another folder and mark them as read, then the Thunderbird icon in the docker shows unread emails, even though all my emails are read. @Etienne, I see something similar although I don't use Thunderbird's filters. Your problem is probably covered in bug 1726116 where it is stated that Thunderbird doesn't send updates correctly.